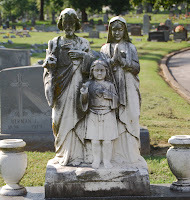 The first two photos below come from St. Joseph Catholic Cemetery in Evansville, Indiana. These photos taken by Vannetta McDowell are part of Vannetta's collection of tombstone photos displayed on the shelves behind the counter & desk of the second floor at Willard Library. Above is the top of a grave marker showing the family. Below is the grieving angel holding a wreath. Below is the grave of Vannetta's aunt who died as a child buried in Pythian Ridge Cemetery in Union County, Sturgis, KY. ( Emma Gould Ghormley). The 3 photos above were taken & submitted by Vannetta McDowell. These two photos show the Tombstone Photo Collection at Willard Library put together by Vannetta. The next four photos are of the display case at top of stairs to the second floor on "Cemetery Restoration and Preservation." Vannetta put this display together, as well. The glass shows sun light reflections, but you can still see most of what was caught in the photos. This is another display in a neat "Treasure Chest" that was created by Lyn Martin. All of these are at Willard Library... visit the library and take a look. Let the staff know how much you like the displays - they work hard on these and deserve some praise. Each month is a new theme. Oh, and check out the display case as you first enter Willard.